Why is the customer relationship management system important for your business? With the growth of a company and the expanse in its customer base inevitably comes an increase in the number of tasks, as well. Managers may be forced to handle and process an enormous amount of information which, in turn, may result in overexertion and distractions. An enterprise functions much like a living organism: if one system fails, it will affect the work of the entire company. This is why a holistic, process-oriented approach is key to the success of every business and should take into account the analysis of all processes within the enterprise rather than isolate and focus on the individual departments or employees. A customer relationship management system, or CRM, can greatly improve the quality of work of a company’s managers. It allows you to store, access and analyse an enormous amount of information in a quick and efficient manner, freeing up valuable time and resources. A CRM can store all of your employees’ and clients’ data in a single system which maintains a complete history of your business’ interactions and relationships with its customers. In turn, utilising such a system can increase the effectiveness of managers and boost productivity. CRM systems generally have capabilities that allow them to automate a number of processes and simplify routine operations such as preparing standard documents or sending and keeping track of emails. By automating these processes, a business owner can essentially ensure that their managers have the time and resources to focus on more demanding and complex operations. A CRM system can also produce sales funnel reports – you can easily compare the changes in the sales funnel and keep track of how deals move through the stages. By analysing the sales funnel, you can identify steps in the process that might require additional attention and prioritize them or focus on the most valuable transactions. Additionally, a CRM system allows you to improve the day-to-day functioning of your company by automating the scheduling and planning processes. An organised business is a successful one and efficient time management is the key to smoother business operations. 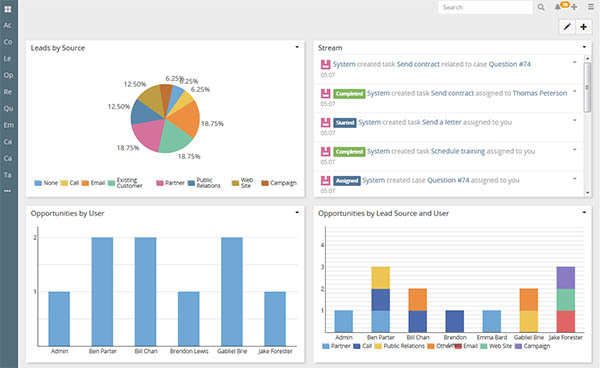 Last but not least, a CRM system also enables you to keep track of how your employees and managers are doing, and have complete control over the execution of both mundane and more complex tasks. Relationships with customers are the key to every business’ success, regardless of the niche of the industry. By automating simple processes like handling documentation via utilisation of a CRM system, you can provide your managers with the time and resources to focus on more demanding operations, and strengthen your company’s relationship with its clients, leading to higher customer satisfaction and greater revenues.